All courses on this site offer Category A credits which are good for your ARRT CE requirements*, and are accepted by NMTCB, ARDMS, SDMS, every US state and territory, Canadian province, and all other Radiologic Technologist, Nuclear Medicine, and Ultrasound Technologist registries in North America for both full and limited permit technologists, guaranteed. Choose a course below with the number and type of credits you need to find out more. Covers radiation protection for all technologists as well as digital requirement for California techs. This course is everything you need to fulfill your ARRT* and state requirements for general radiography in one shot. Good in all 50 states. This course discusses radiation protection in mammography for patients and staff for 5 CE credits. This course discusses radiation protection when performing fluoroscopy. Completes CA fluoro requirement and radiation protection requirements in other states. You work with radiation, can you answer complex questions about it? Get up to speed and more with this course. Good in all 50 states and with ARRT*. Meets requirements for CQR for Bone Densitometry CE, and ALSO good for general radiography in all 50 states and Canada. Get 2 category A CE credits while learning about the history and future trends in radiology and medical imaging. This course discusses digital radiography and PACS. Meets technical requirements in all 50 states and completes the CA digital requirement. Get 2 credits today with this fast and easy course covering anatomy and radiographic positioning of the thigh, knee, tib fib, and ankle. This course offers a full 20 credits for ARRT* and all but 3 states. But be advised, this course offers only PARTIAL or NO CREDIT for CA, FL, and TX STATE registries. 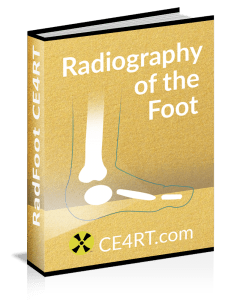 This course covering anatomy and radiographic positioning of the foot is a great way to get 1 credit fast and easy. Fluoroscopy CE Credits good for all US states and Canada as well as California Fluoroscopy CE for techonlogist and physician CA license requirements. Get 1 category A CE credit for reviewing the anatomy and radiographic positioning of the hip and pelvis. Sonography CE Credits for ARRT* or ARDMS. Provides structured education for post primary certification and continung qualification requirements. A mammography review course guaranteed to provide 15 Mammography CE credits for ARRT*, MQSA, and all 50 states' registries. Not sure what you need? Read all about ARRT* requirements here. Still having doubts? Check out our zero risk guarantee policy. Note that this article discusses ARRT credits. For other states and registries please visit the corresponding page from the main home page or main menu. The ARRT* (American Registry of Radiologic Technologists) requires that you attend 24 hours of continuing education every two years. This education time is quantified as credits (or sometimes called units) where one credit equals one hour of education. Most state agencies follow this example as well. How do I report my X-Ray CE credits? If you are ARRT certified, you must submit an application for renewal of registration to the ARRT near the end of your biennium, but not after. CE credits must be listed on the CE Report form that is included with the application and can only be reported at the end of the biennium. Every state agency has structured their system around this. Who keeps a record of my credits? You are in charge of keeping your own records. The ARRT does not maintain a record of CE credits. Most state agencies also do not maintain these records. It’s up to you to keep a record of the courses you took. If you purchase courses here at CE4RT.com, your records are kept online and you can retrieve your certificate of completion any time. No. You must send in your credits yourself to the ARRT and / or the state agency you are registred with according to their requirements. We do report to Florida for Florida licensed technologists monthly, but you still must report it yourself also. What kind of credits do I need? What’s the difference between Category A and A+? For all X-ray techs, mammography techs, nuclear medicine techs, radiation therapy techs, CT techs, etc., Category A credits are what you need. A+ are accepted if you have them, but not necessary. Category A credits are also accepted by all state agencies for those disciplines and limited license techs also. Unless you are a Registered Radiology Assistant (RRA), or a similar specialty where your registry told you that you specifically need A+ credits, you do not need A+ credits. How many credits are required each year? Most registries require reporting credits every two years, not every year. This two year span is called a biennium. Again, unless you are an RRA, the ARRT requires 24 Category A credits for each biennium period. All US states follow this requirement also. I received applications training at work. Does this count? According to the ARRT guidelines, up to 8 CE Credits per biennium of applications training completed at work as long as they were issued by an approved provider. If you received more than 8 credits for this type of training you can probably only claim 8 and you should contact the ARRT if you plan to try and claim more. What are the mammography CE requirements? Visit our section on Mammography Courses to find out more about MQSA, ARRT, and State requirements for Mammography. I did not complete my CE credits by the end of my biennium. What should I do? If an R.T. applies for renewal of registration of a certificate, but failed to meet the CE requirements within the previous biennium, their registration will automatically be transferred to “CE probation” status. The CE probation period will begin on the first day of the birth month and extend until the last day of the sixth month. During the CE probation period, they will be allowed to complete the credits that were lacking during the biennium period. When the CE probation credits are complete, a CE Probation Report must be submitted along with a $50 fee. When CE compliance is confirmed, the CE probation designation will be removed and a new credential card issued. Can I use academic courses that I took in college for CE credit? Academic classes that are related to the profession, and completed through a post-secondary educational institution accredited by a mechanism recognized by ARRT may in some cases be claimed for CE credit. There are specific guidelines for this posted at the ARRT site. You should check with the ARRT or your registry well in advance if you intend to attempt to claim college courses as part of your CE Credit requirement. How do I know if an activity has been approved for Category A or A+ credit? All Category A or A+ credits must be approved by a RCEEM or RCEEM+, or by an ARRT recognized state licensing agency. Documentation of participation in Category A and Category A+ CE activities must be on a certificate or in written form that clearly indicates the information needed to identify the activity as having been approved by a RCEEM or RCEEM+. For ARRT, biennium dates are assigned based on a technologist’s birth month. It is due in on the last day of the month BEFORE the month of your birthday. In other words if your birthday is in April, you need to finish your CE Credits on or before March 31st. The ARRT does not allow you to change the month or day that the biennium begins or ends. However, requests to change the year the biennium begins or ends can be made. You would need to write to the ARRT for that. The requirements of state agencies may differ. Timing is important for earning and reporting CE. The credits must be earned within, not before or after, your assigned biennium. These dates appear on your crediential card. The credits must be reported no earlier than two months prior to your birth month, but must be completed and reported by the last day of your birth month. I just passed an exam. Does that count for credit? Yes. When you have passed one of the exams for our courses, the time that you got a passing score is recorded. This time is printed on your certificate and can be verified by your registry. You are instantly good for the amount of credit stated for that course and as is displayed on your certificate of completion. You simply need to follow your reporting requirements. Does the ARRT audit my CE reporting? Occasionally, the ARRT may audit your CE reporting. The ARRT selects records to audit through two means: (1) If there are any inconsistencies on the CE report form that is submitted and CE compliance cannot be determined, then the record will be flagged for audit; (2) They have a computer program that randomly selects CE reports for audit. The audit process, which helps ensure that all R.T.s are in compliance with the requirements, should be painless. R.T.s are required to have copies of all their certificates of participation before they fill out the report form. For the audit, just send copies of the original certificates to ARRT. There is a code on your certificate of completion that can be used by agencies to verify the authenticity of your credits acquired here. If the ARRT or any state agency or employer needs to verify your credits obtained at this site, have them contact us. Do I need to complete additional credits for each area in which I am certified? The Continuing Education requirement is not dependent on the number of ARRT certificates held. However, R.T.s should select CE topics related to their area of practice and that will address their needs. Most state agencies follow the example of the ARRT. Do I have to complete a certain amount of lecture credits, a certain number in-house credits, and a certain number of online credits? Currently there is no restriction on the type of CE credits an R.T. needs to earn as long as they are approved as Category A or A+. I completed more than the required number of CE credits in the past biennium. Do they carry over? No. The ARRT does not carry over credits. State agencies follow this example. When an R.T.’s ARRT Renewal of Registration has been processed, CE transfers cease to be accepted by ARRT. Should CE be specific to job performance? The CE requirements were developed with the philosophy that, as professionals, R.T.s are in the best position to determine what type of CE will most benefit them. All technologists should select CE topics that are related to their area of practice and that will address the needs of the patient and of the Registered Technologists. Do you keep a copy of my previous biennium reports? All of the courses you have completed here at CE4RT.com are on record and accessible by you. We are considering a mechanism for you to record CE credits obtained elsewhere, but that is under consideration for future development. Why do directed readings require a post test, but lectures do not? The exam requirements for courses on this site (number of questions etc.) are designed to meet the minimum requirements of ARRT. The post test provides documentation of participation in the directed reading, in addition to an assessment of learning. Documentation of participation in a lecture is provided by attendance records. Where can I find out complete details? For more information, go to the source at ARRT CE Reporting requirements.